Both of my kids are in school this year. That should be a good thing, it turns out it has brought about a lot of drama. My oldest was officially diagnosed with ADHD this summer (after 6 months of testing, doctors etc.) which has brought about a lot of changes. Just when my oldest got everything under control (he has straight A's in school this year), my younger son started having severe separation anxiety. I'm not talking about a little crying at the bus. Last week he had a full meltdown and wouldn't even get on the bus, leading me to carrying him almost a mile to school. Who needs cross-fit when you can carry a 45 pound child a mile everyday. He has his good days and bad days. Some mornings he wakes up and is ready to go, other days start with an hour of crying and me crossing my fingers he will actually get on the bus. I love both of my kids, but I never knew how hard it can be to deal with emotional/health issues. Luckily the more I deal with my kids issues the better parent I am becoming. I just wish that kids came with a manual, it would make everything so much easier. In addition to the separation anxiety issues my youngest is skinny. So skinny that if he loses anymore weight it will become a problem (he has always been below the 5th percentile for weight, but he hasn't gained much weight in the last year). My oldest also stays thin and eats all the time, so I keep a constant supply of snacks in my house. 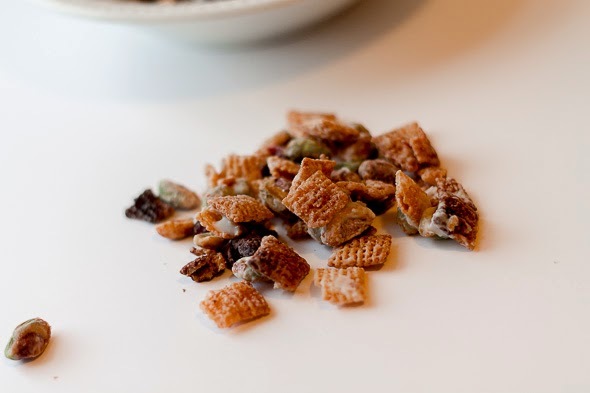 Snack mix is always popular and can be made in big batches, which is always nice. The following is a recipe for White Chocolate Pistachio Snack Mix. Melt butter, sugar, vanilla and kosher salt (to taste) over medium heat. Pour mixture over rice cereal. Toss to make sure cereal is evenly coated. Place mixture on the baking sheet in an even layer. Bake until golden brown, approximately 10 minutes. 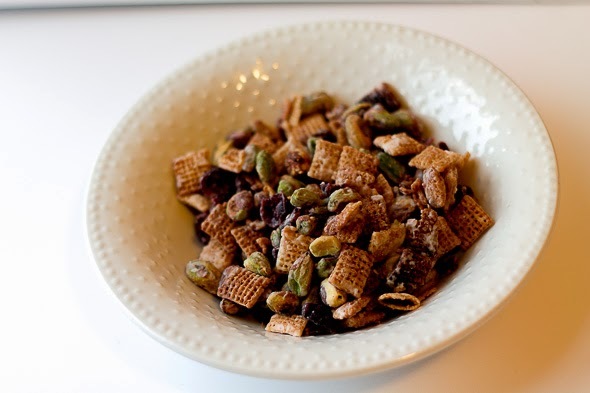 Toss cereal mixture with pistachios, dried cranberries and white chocolate chips. Let cool and they break apart. This cereal mix can also be made with corn chex if you prefer. The original recipe kept the chocolate chips whole at the end. My family loves it when the chocolate chips melt into the cereal and nuts. Either way works, so experiment to see which version you prefer. I use salted pistachios, but if you prefer to reduce the sodium use unsalted nuts.